We've linked to quite a few of the GMO forecasts over the years, but haven't since 2015. Mr. Grantham's dour outlook was not in tune with what was actually happening in the markets and didn't really reflect our views. So instead we've taken to linking to his commentaries where oddly enough Mr. G, got exuberantly - and correctly - bullish a few years ago and we have been leaning toward his original melt-up target of S&P 3300 as a blow off top. He hedged a bit in conversation with The Economist April 10 but said there was still a 40% possibility. "An update from Jeremy Grantham"
See special note after the jump. 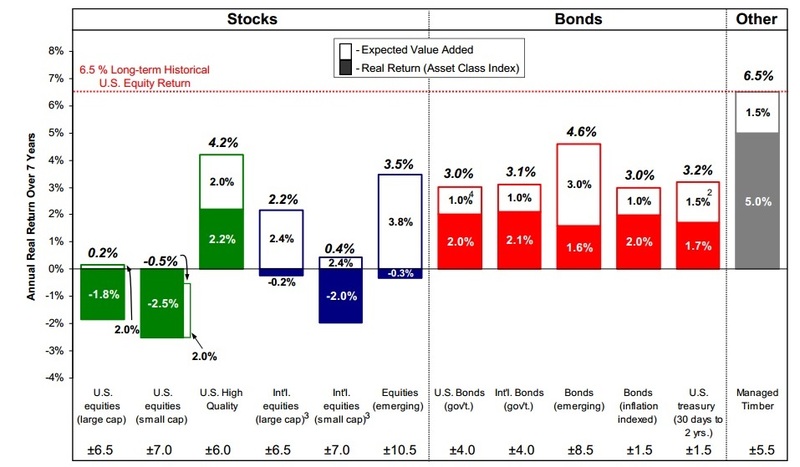 The GMO Asset Allocation team has released its latest 7-Year Asset Class Forecasts. Most global equity markets declined in the first quarter despite the corporate sector generally reporting reasonable fundamental data. As a result, GMO's 7-year equity forecasts mostly improved over the first quarter (see chart below). Even with these improvements, International and U.S. equities are still forecast to have flat to negative real returns over the next 7 years, with Emerging equities remaining an exception, forecast to have a positive real return of 1.9%. "To us, the opportunity set for equity investors looks pretty clear: favor non-U.S. markets, especially value stocks in emerging markets," says GMO Asset Allocation team member John Thorndike. "Additionally, with the Fed continuing to raise short-term interest rates and the potential inflationary effects of tariffs and trade wars, we think investors are well served to keep their duration short." "Grantham’s ‘Horrifically Early’ Calls Challenge GMO"
How Good Is Jeremy Grantham's Forecasting Record? From James Montier’s GMO Quarterly Letter, July 2013, titled The Purgatory of Low Returns, download the full PDF here (registration may be required). 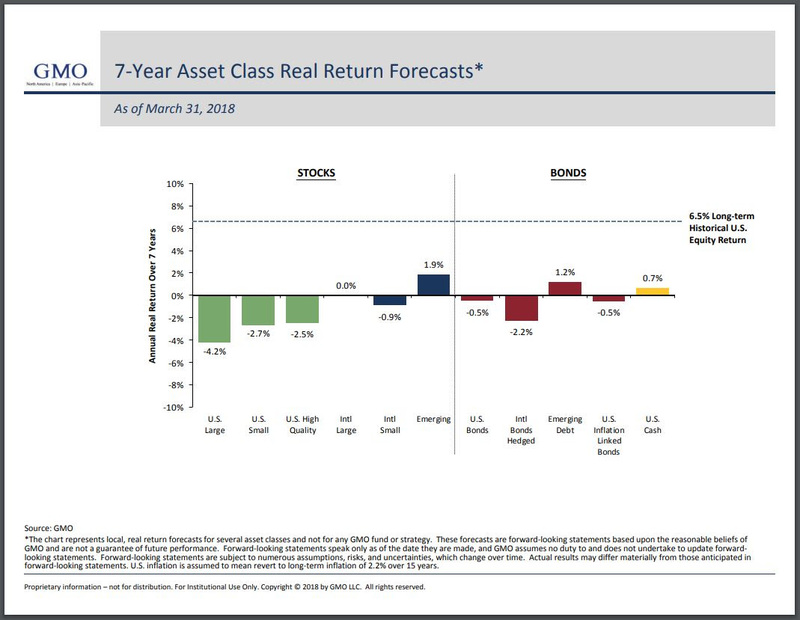 Jeremy Grantham: "GMO’s 7-Year Asset Class Return Forecast"